Gary and Sarah visit the Gold Coast! Gary and I have recently been travelling through the Gold Coast visiting the fantastic newly opened GP practices. The GPs we have spoken to have been initially nervous about joining a newly established surgery. However, the surgeries have been very focused on marketing and promoting the new surgery increasing publicity. There are new patients joining every day. One surgery had at least 25 patients signing up a day and were attracting a high number of walk-ins. Building up patient numbers in a new practice located alongside a pharmacy should not be difficult. Opening in shopping centres is a deliberate strategy for general practices in Australia as they have good amounts of free parking, high foot traffic, and additional medical services in-house. If a doctor is running behind on appointments patients can always pop out for a cup of coffee whilst they wait, which seems to keep everyone happy! GP Practices heavily market the arrival of their new doctors and promote any special interests that you may have. If you are wanting to do any extra training to develop new clinical skills this is always encouraged. If you are looking to work in a modern practice with incredible infrastructure, modern treatment rooms, a Molemax machine for the latest skin imagery, ultrasounds etc. then contact Gary Scott for more information. 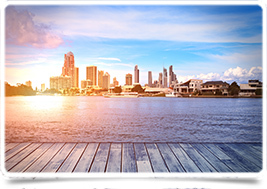 Find out what the Gold Coast has to offer a GP looking to relocate to Australia. It has some of the most modern and well-equipped practices that we have seen and yes, they are very busy! Keep checking back to our website for the latest updates on our adventure!